When Gran Quilombo Discos started planning on compiling '60s and '70s songs influenced by Jamaican rhythms by different artists from the Latin American continent, and published the first two volumes of Latinameriska (QUILOMBO 001LP and QUILOMBO 002LP, 2013), the label didn't think they would be able to continue with the series. However, this period of time has allowed them to continue with the "archaeologic work" of the search and capture that every collector has in its blood. There's no bigger pleasure than being on a trip and going through a flea market, shop or just exploring the web and coming across a gem to thicken your record collection. Likewise, it's also a big satisfaction showing those discoveries and making them available to other collectors (so they can start their own hunt) or to the general public which would simply dance and enjoy them, which is enough. Thus, this record is the fruit of that passion and has no different goal to the previous volumes that you listen, dance and enjoy this "piece" of Jamaica born in Latin American territory. 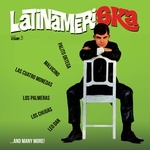 You'll find artists you'll already know from previous volumes, such as Las Cuatro Monedas or Conjunto Habana, together with real rarities such as Aristides Paz or The King's Trials... With covers of Jamaican classics ("Ritmo Del Alma") and original tracks ("Cuando Tú Me Quieras"), from vintage ska ("Lucky Lucky") to reggae with skinhead roots ("Doble Barril")... but always with the same essence. And not to lose a good habit we close with a new ghost track, from Colombia in this case and merging a Jamaican music classic with other classic rhythms. Enjoy it one more time! Also features Malvicino, El Klan, Leo Dan, Los Teen Agers, The Summits, Los Palmeras, Los Chijuas, Marimba Orquesta La Perla Del Soconusco, and Palito Ortega. The journey of Latin American artists from the '60s and '70s with a Jamaican style has a new stop: Latinameriska's fourth volume. And even though it may sound like a cliché we Gran Quilombo Discos would like to say this is the best installment of the series without a doubt. Here's why: You'll get to learn about unknown bands (from out of the Jamaican scene like Los Creyentes De B.C. or studio ones like The Stars), get almost impossible to find tunes (from Rosario or Los Costeños) or listen to covers as good as the original (hurray for Los Robbin's). Or with sounds that enrich the cover (those amazing Calypso touches of René Santos or the cumbia flavor of Carmen Rivero). The richness of "Latin Jamaica" has no limits, and from north-to-south and east-to-west the treasure chest keeps growing with gems of all kinds. These precious stones are all different and all highly valuable -- from Jamaican beat to early reggae or calypso -- with covers that range not only from Jamaican scene classics to jazz and soul. With such good raw materials and the label's culinary expertise, it was impossible not to cook a delicatessen to be consumed with the ears. And once again, there's a ghost track at the end, from Panamá this time and giving an Antillean flavor to another Jamaican classic. Enjoy this new installment and be calm, it won't be the last one! Also features Hugo Blanco, Su Arpa Viajera Y Su Conjunto, Julián Ber't, Carmen Rivero Y Su Conjunto, René Santos Y Sus Estrellas, Roberto Delgado And His Orchestra, Ely Combo, Las Cuatro Monedas, Los Yorsy's, and As Exorcistas. Gran Quilombo Discos presents volume 1 in a compilation capturing the influence of Jamaican sounds on the Latin American continent in the late '60s/early '70s. It shows this influence in its different variants (ska, rocksteady, early reggae), with a very diverse range of groups, such as Toño Quirazco, Las Cuatro Monedas (The Four Coins), John Kingston and Montego Karachi, to Ronnie Montalbán, who devoted his life to ska. Renato e Seus Blue Caps had their own songs and versions as well. Includes one surprise bonus track. Gran Quilombo Discos presents volume 2 in a compilation capturing the influence of Jamaican sounds on the Latin American continent in the late '60s/early '70s. The label followed the same guidelines as the previous volume, and even included some of the same groups (Toño Quirazco, Ronnie Montalbán). Others appear here for the first time as is the case of Teipus and Rebels, who present little treasures that will delight fans of Desmond Dekker, or LosYorsy's and Donald, who published their 7"s internationally. In fact it was Donald's version that Spanish group Los Mismos made a very successful hit with back in the '70s. Includes a surprise bonus track.